Jefferson Nickels are United States Five Cent coins. They were first produced in 1938. They are still produced today. There is an interesting story about the designer of this US Nickel Coin featuring Thomas Jefferson. The Mint sponsored a contest with a prize of $1000 for the best design of the new nickel (five cent) coin. A German immigrant named Felix Schlag, who had only been a United States citizen for 9 years, won the contest from among 390 contestants. 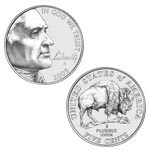 The design of the US nickel remained virtually unchanged until 2003. There was only a slight change to the design of the steps of Monticello in 1939. 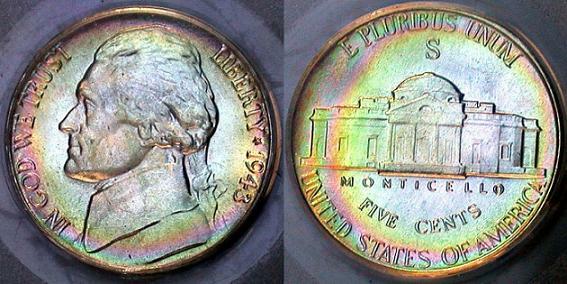 The Jefferson Nickel is made of 25% nickel and 75% copper. There was a brief period of time however, when these coins were made of 56% copper, 35% silver and 9% manganese. This was during World War II. During the war, it was hard for the US Mint to get nickel to make the coins out of. It was being heavily used in the war effort. So, some changes had to be made. This resulted in a nickel that did not contain any nickel. These "wartime" nickels were issued from October 1942 through December 1945. A large mint mark was place on these new silver nickels above the dome of Monticello so that they could easily be distinguished from regular "nickel" nickels. These included the marks "S" (San Francisco), "D" (Denver) and "P" (Philadelphia). Note: This was the only time a coin from the Philadelphia Mint had a mint mark before 1980. 2004-2006 Saw Big Changes in a US Nickel Coin That Had Remained Virtually Unchanged for Almost 70 Years. These new nickels were produced in 2004 and 2005. 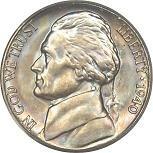 They feature Thomas Jefferson on the obverse as in previous years. The reverse designs commemorate the bicentennials of the Louisiana Purchase and the Lewis and Clark expedition. The new 2004 Nickels have two new designs on the reverse. to give to Native American chiefs and other important leaders as a token of goodwill of the United States. They had a portrait of President Jefferson on one side and symbols of peace and friendship on the other. The Keelboat reverse depicts the boat that Lewis and Clark used during their expedition. The 2005 US Nickel coins feature a new, more modern version of Thomas Jefferson along with two new designs on the reverse. They also feature the word Liberty in Thomas Jefferson's own handwriting. The first was a return of the American Bison after nearly 70 years. The second features a view of the Pacific Ocean and the quote from William Clark, "Ocean in view! O! The Joy!" Interesting Note: William Clark's actual diary entry said, "Ocian in view! O! The Joy! ", but the US Mint modified it to read "Ocean", a more standard spelling of the word. They were afraid that collectors would mistake the original spelling as a mint error and hoard the new nickel coins. With the 2006 US Nickels, Monticello was returned to the reverse of the new nickels and an all new Thomas Jefferson, facing forward, was designed for the obverse (front). These US Nickels also feature the word Liberty in Thomas Jefferson's own handwriting. Note: This is the first US coin produced for circulation that features a President facing forward. Jefferson nickels are a great coin set for the beginner to collect. A good selection of dates can still be found in your pocket change or from rolls of coins picked up at your local bank. The few dates that can't be found in circulation can be bought at a reasonable price. You would probably not have to pay more than $15 each to get nice examples of these US Nickels. The 1950-D and the 1939-D, although rare, can be bought for a few dollars each in the mid-to-lower circulated grades. The "wartime" nickels, made of 35% silver (1942-1945), are others you will probably have to buy. But, you can probably get some decent circulated examples of these for a few dollars each as well. 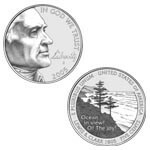 Learn more about the Jefferson Nickel's Design Specifications, including information about: designers, years minted, mintages, weight, composition, diameter, and edge.